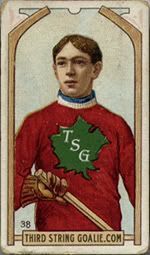 Born on this date in 1883 in Rat Portage, Ontario, Tom Hooper, known as a formidable checker and clever stickhandler, joined the Rat Portage Thistles of the Manitoba Senior Hockey League at the age of 18. 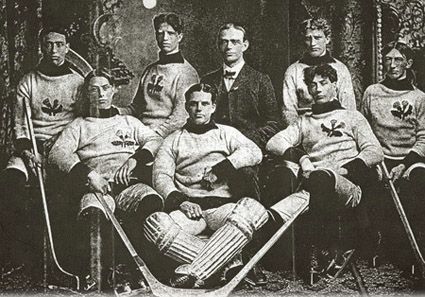 The Thistles won the league championship in 1903, and emboldened by their local success, travelled east to challenge the Ottawa Silver Seven for their grip on the Stanley Cup in March of 1903. Their series was a two-game, total-goal contest in which the Silver Seven took a dominant 6-2 win in Game 1, leaving Rat Portage a task they could not overcome. Game 2 also went the way of the Silver Seven 4-2, allowing them to retain their hold on the trophy. 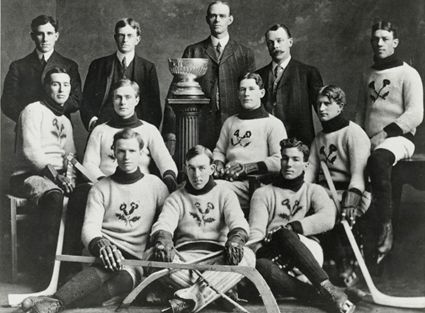 Two seasons later following a 7-1 regular season record in which he scored a career high 9 goals, Hooper and the Thistles, now older and wiser than the teenagers of 1903, once more challenged mighty Ottawa for the rights to the Stanley Cup. This time around, the contest was a best-of-three format and the Thistles broke out on top with a 9-3 win in Game 1, which certainly must have had the Thistles faithful pining for a return to the two-game, total-goals format. The Senators welcomed back center Frank McGee for Game 2, and Ottawa responded with a 4-2 win to even the series. The decisive Game 3 once again went the way of Ottawa in a nail biting 5-4 win for the home Senators, sending the Thistles back to Rat Portage empty handed. Hooper finished the series with a pair of goals this time out. 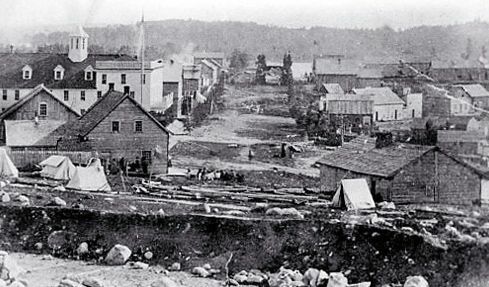 In 1905 the town renamed itself Kenora while the hockey club continued to be known as the Thistles. 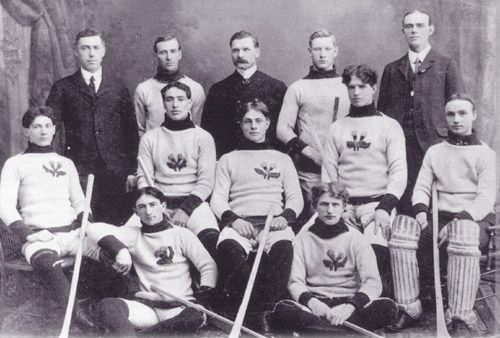 The Thistles won the MAHA title in 1906, but circumstances out east did not allow time for an immediate challenge, so one was scheduled during the following 1906-07 season. 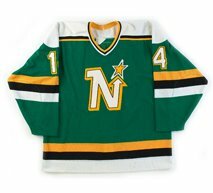 In January of 1907, the time arrived for the Thistles challenge for the Stanley Cup and they traveled east once more, this time to face the Montreal Wanderers, who had wrestled away control of the cup from Ottawa during their league playoffs. The Thistles, with future hall of famers Joe Hall, Tommy Phillips, Art Ross, Billy McGimsie, Roxy Beaudro and Hooper, defeated Montreal 4-2 in Game 1 on January 17 and won the coveted Stanley Cup on four days later with an 8-6 triumph to win the two-game, total goal series 12-8, with Hooper contributing 3 goals in the second game , making Kenora, population 4000, the smallest town to have ever won a major sports championship in North America. Following the Thistles' Manitoba Professional Hockey League season, they defeated Brandon Wheat City 8-6 and 4-1 to win the league's playoff championship, which also allowed them to retain possession of the Stanley Cup. 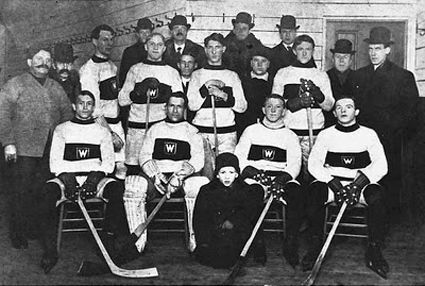 Five days later, on March 23, the Thistles took to the ice to defend their cup against the Wanderers, this time in Winnipeg but without Hooper who had fractured his collarbone. Montreal took Game 1 by a score of 7-2, and although Kenora won the second game 6-5, it was not enough to overcome Montreal's 5 goal margin from the first game, and the cup was again headed back east, ending tiny Kenora's reign as champions of all of Canada after just two months. 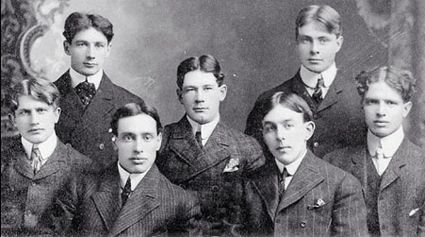 Gutted by player defections to professional clubs, the Thistles folded after just one game of the 1907-08 season and Hooper moved east to play one game with the Pembroke Lumber Kings prior to joining the Wanderers for two regular season games, as well as their defense of the Stanley Cup they had claimed back from Kenora a year earlier. The Wanderers easily fended off the challenge from the Ottawa Victorias 9-3 and 13-1 with Hooper having moved back to a defensive role with the Wanderers. 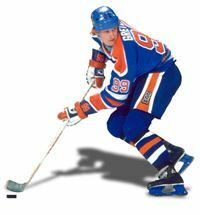 Hooper then joined the Montreal Amateur Athletic Association club for the remaining seven games of the season in which he scored 9 goals and subsequently retired as a player, having played for seven seasons in 65 games and scoring 48 goals as well as winning the Stanley Cup twice. 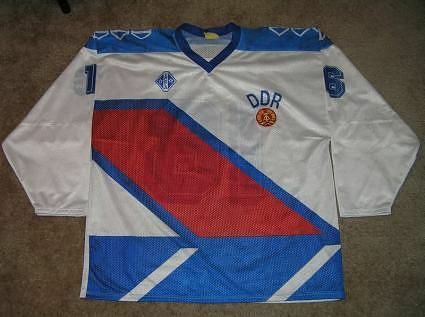 He was later elected to the Hockey Hall of Fame in 1962. 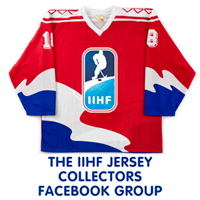 Today's featured jersey is a 1902-03 Rat Portage Thistles Tom Hooper jersey. 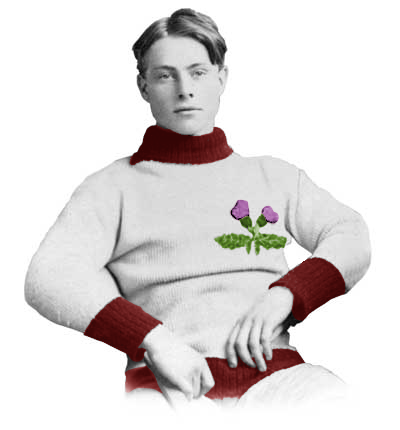 The Thistles name was selected from a local name the team contest, with the winner, a local Scottish carpenter named Bill Dunsmore, who not only submitting the name "Thistles", but a drawing for the logo that would adorn the team's sweaters as well. 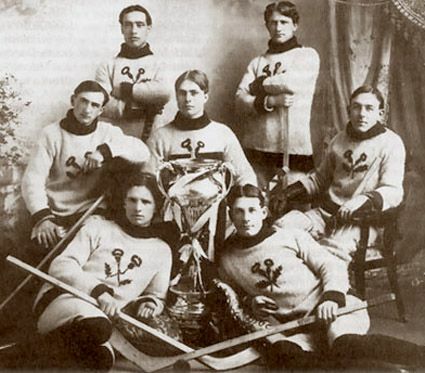 Most often the Thistles logo would appear centered on the teams sweaters, but as seen in the above team photo from the 1903-04 season, there was some inconsistency in 1902-03 and 1903-04 where some sweaters had what would become the standard centered logo, some had the logo over the left breast and some had no logo whatsoever. Today's video segment is a look at the Kenora Thistles. While the original Thistle club disbanded in 1908, subsequent clubs in Kenora have adopted the Thistle name, which was the case for the club that interview subject Louis McKay played on in 1934.